*How about in the District of Columbia? Yes. 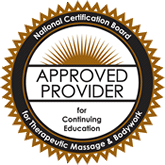 It is your responsibility to report which courses you have taken with Nirvana Massage and to deliver that information to your state Board of Health. Your COAs (Certificate of Achievements) are your proof so, print these after each test, and deliver them in your state when you apply for renewal. Also, the state where you are practicing massage may require you to complete a certain number of CEUs "hands on" training. Check with your state to see what they require. On a national level, these courses count! The courses offered at Nirvana Massage CE National are high quality home study courses. The information is easy to read and retain and carefully researched by our staff. All coursework is the most current, up to date information in the field. It is delivered to you in a "pdf" file. Simply read the material. Listed just after the course outline is the test link and password. Type the test link address into a new browser. The test site for that course will pop up, so enter the password, follow the prompts given, and take the mutiple choice test. Content copyright 2012,2013 Nirvana Massage CE National, LLC. All rights reserved. All trademarks and/or copyright are in effect.